In today’s edition, we will cover News Analytics platform – A smart tool that not only aggregates news from across the globe but also analyses its impact on equities, commodities, currencies, economies in REAL TIME. Heckyl’s News platform scrutinizes all the relevant news and tweets that are published on the internet and evaluates its impact instantly. 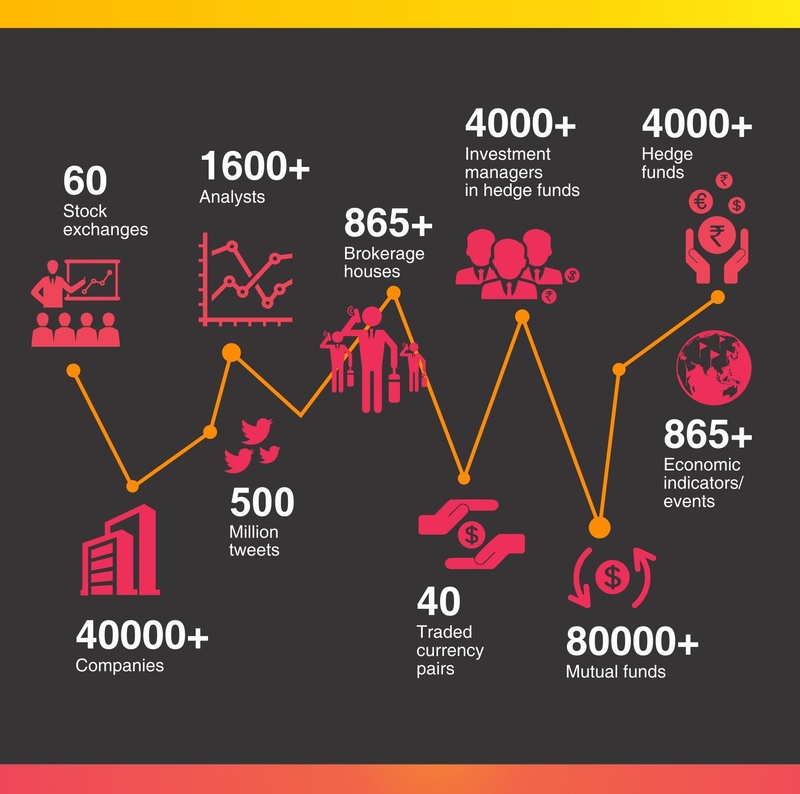 Heckyl’s news platform covers 60 stock exchanges, over 40000 companies, more than 1600 analysts and 865 brokerages across the world. Under our umbrella we also track in excess of 4000 hedge funds as well as equal number of hedge funds managers. Apart from this we also keep an eye on 80000 plus mutual funds and 500 venture capitalists/private equity entities.This shows the depth and width of the data covered by Heckyl’s News platform so that a user doesn’t miss any news from any part of the world. Trending News: Heckyl captures all the vital news on every listed stock and computes its impact (Positive, Neutral and Negative) in real-time. Before evaluating the news, Heckyl makes sure that the news is only picked from legitimate sources by rating each source for news and twitter in its universe. After aggregating, it makes a cluster of all the related news on that particular event to evaluate its impact. Heckyl’s algorithm not only tags the relevant stocks, commodities or currencies to a particular news or an event but also classifies it into various categories like product launch, legal, M&A, JV, recalls, etc. This will assist the user to conveniently find a news of his choice in just one click. 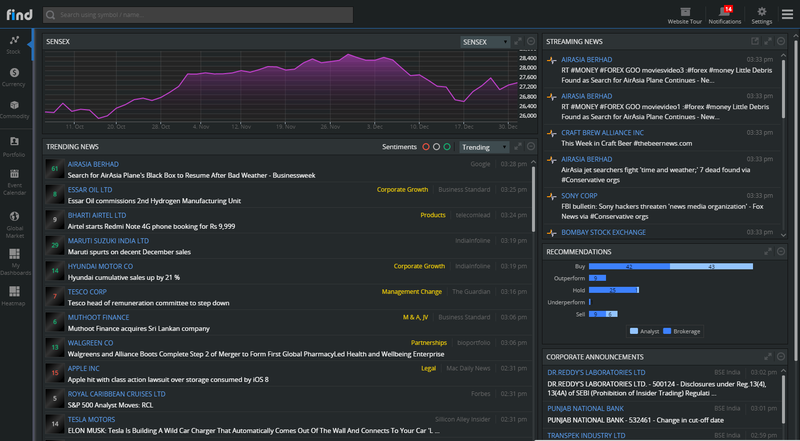 Streaming News: Heckyl scans 500 million tweets every day to discover all the relevant news and data related to stocks in your portfolio. For twitter users and blogs, Heckyl has done 5 years of back testing to rate all the sources with regards to their accuracy for bloggers, tweeters, particular sectors and individual companies. In addition it also tracks the location and measures the velocity of the source, looking at the number of followers, retweets and several other parameters to calculate the reach as well as the accuracy. Recommendations: With FIND, you can view all the buy/sell brokerage reports of 60 global stock exchanges covering more than 40,000 companies in a consolidated window on your screen. Corporate Announcements: It also updates corporate announcements sent to the bourses in real-time and one would never miss any announcement or notices on any stock in his watchlist or portfolio. Notifications and Alerts: Live streaming of news as real-time pulse and sending appropriate alerts to users is another striking feature of this product. Here you can also view latest news and historical news up to 2 weeks. Apart from stocks, one would get live news, alerts and notifications on commodities, currencies, geo-political news from 35 countries. Now, let us take a case study of Mastek on September 15, 2014 to understand how News Analytics platform can be utilized by traders and investors to explore trading opportunities in real-time. 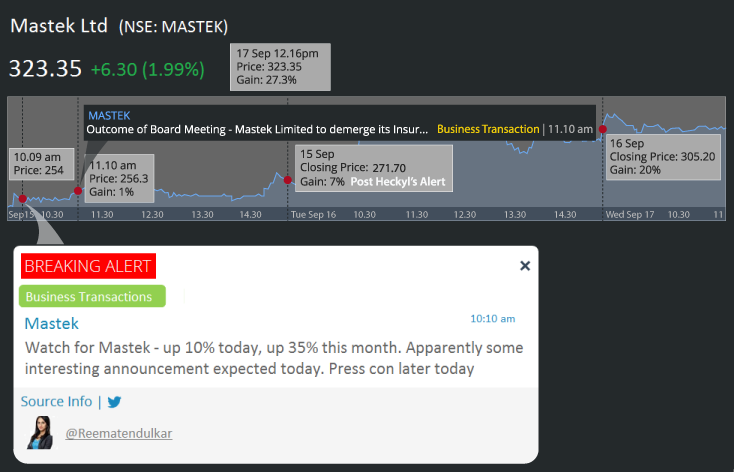 On September 15, 2014 Mastek, a midcap IT company opened in green. Around 10.09 am, Reema Tendulkar of CNBC-TV18 who tracks IT sector tweeted saying some major announcement is likely in Mastek today. Heckyl’s unique algorithm to select tweets of credible and whitelisted sources captured Reema Tendulkar’s tweet in this case and alerted its users about some major announcement in Mastek expected today. Between 10.09 am and 11.10 am the stock added 1 percent additional gains. At 11.10 am, Mastek sent a notice to the exchanges in which the company announced to demerge its insurance business in a separate listed company. This was a big positive news for the stock as demerged entity would capitalize on the growing opportunity in the US insurance market while the parent company would focus on its core businesses and products. Post announcement, the stock rallied close to 20 percent before closing at Rs 270, up 15 percent for that day and 7 percent post Heckyl’s alert. As seen from the above graphic, the stock rallied further to generate a massive return of 29 percent in just three days after real-time alert given by Heckyl to its users on September 15. A trader or investor can now position himself well in the market by deploying a trading strategy using News analysis and breaking alerts in real time. Stay informed with our News product on various asset classes across the universe and rely on Heckyl to keep you updated around the clock. This entry was posted in Home, Product Beat and tagged Alert and Discovery, Heckyl, Mastek, News Analytics. not understanding anything totally, but this post gives fastidious understanding even. webpage, this weblog is actually remarkable. me to pay a quick visit this website, it contains useful Information.